SKU: CS105FWD. Category: Single Capacity Urns. 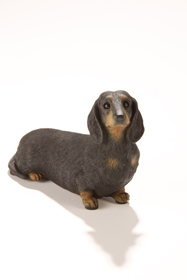 Tags: artistic urns, ash urns, cremation urns, designer urns, memorial urns. 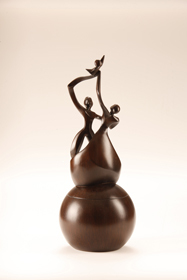 This Dance of Life Memorial Art Urn, created by award winning American sculptor Stephen Canneto, celebrates the spirits of two – joined in life – now linked forever together through time. The urn’s female and male figures, balancing each other on the sphere, symbolize life’s dance with the ebb and flow of its tempos, measures and beats. 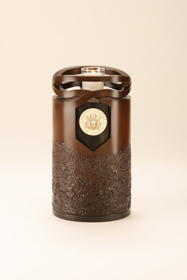 This Dance of Life Memorial Art Urn is a shelter for ashes, a shrine and remembrance honoring and preserving the memory of our loved ones. It carries our memories forward keeping them alive in time and in our hearts. 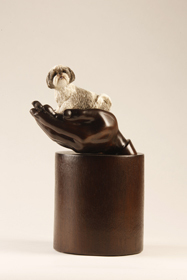 Made in America Designed by award winning American sculptor Stephen Canneto, this Memorial Art Urn is cast and finished by skilled American craftsmen. 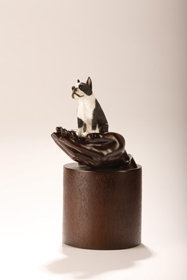 This Resin cultured wood urn is hand cast, finished and individually painted by a skilled crafsman. As with all individually created works of art the hand finishes on this Memorial Art Urn will vary slightly from one to the next in color and texture.